"Mo Di" and "Mo Ti" redirect here. For the posthumous name of some Chinese emperors, see Emperor Mo (disambiguation). For other uses, see Mozi (disambiguation). This is a Chinese name; the family name is Mo. Mozi (Chinese: 墨子; pinyin: Mòzǐ; Wade–Giles: Mo Tzu, Lat. as Micius, ca. 470 – ca. 391 BC), original name Mo Di (墨翟), was a Chinese philosopher during the Hundred Schools of Thought period (early Warring States period). A book named after him, the Mozi, contains material ascribed to him and his followers. Born in what is now Tengzhou, Shandong Province, he founded the school of Mohism that argued strongly against Confucianism and Daoism. His philosophy emphasized self-restraint, self-reflection and authenticity rather than obedience to ritual. During the Warring States period, Mohism was actively developed and practiced in many states but fell out of favour when the legalist Qin dynasty came to power. During that period, many Mohist classics are by many believed to have been ruined when the emperor Qin Shi Huang supposedly carried out the burning of books and burying of scholars. The importance of Mohism further declined when Confucianism became the dominant school of thought during the Han Dynasty, until mostly disappearing by the middle of the Western Han dynasty. Mozi is known by children throughout Chinese culture by way of the Thousand Character Classic, which records that he was saddened when he saw dyeing of pure white silk, which embodied his conception of austerity (simplicity, chastity). For the modern juvenile audience of Chinese speakers, the image of his school and its founder were popularized by the animated TV series The Legend of Qin. There has been considerable debate about the actual name of Mozi. Three concepts of its origin exist as of today. Traditionally, Mozi was said to have inherited the surname "Mo" from his supposed ancestor, the Lord of Guzhu (Chinese: 孤竹君; pinyin: Gūzhú Jūn), himself descended from Shennong, the legendary emperor. The descendants of the Lord of Guzhu had the clan name "Motai" (Chinese: 墨胎; pinyin: Mòtāi), which later was shortened to "Mo". However, modern scholarship suggests that "Mo" was not, in fact, the clan name of Mozi, as this clan name/family name is not encountered during the Spring and Autumn period and Warring States period. As "Mo" came to be the name of the Mohist school itself, it might have derived from the name of a criminal punishment (tattooing of the forehead of criminals; "mo" literally means "ink"), usually inflicted on slaves. It signals the Mohists' identification with the lowest of common people. The actual ancestral name and clan name of Mozi is not known. It may be that, because he was likely born into the lower classes, he did not have an ancestral or clan name. During Chinese antiquity, the vast majority of the Chinese people who were not related to aristocratic families did not possess ancestral and clan names. A plausible source of Mozi's name may have been the philosopher's skin complexion itself, which is referred to as "dark" (lit. "black") in the text. "Mozi was going north to Qi and met a fortune teller on the way. The fortune teller told him: "God kills the black dragon in the north today. Now, your complexion is dark. You must not go north." Most historians believe that Mozi was a member of the lower artisan class who managed to climb his way to an official post. It is known, however, that his parents were not affectionate towards him and showed him very little love. Mozi was a native of the State of Lu (today's Tengzhou, Shandong Province), although for a time he served as a minister in the State of Song. Like Confucius, Mozi was known to have maintained a school for those who desired to become officials serving in the different ruling courts of the Warring States. Mozi was a carpenter and was extremely skilled in creating devices, designing everything from mechanical birds to wheeled, mobile "cloud ladders" used to besiege city walls (see Lu Ban). Though he did not hold a high official position, Mozi was sought out by various rulers as an expert on fortification. He was schooled in Confucianism in his early years, but he viewed Confucianism as being too fatalistic and emphasizing too much on elaborate celebrations and funerals which he felt were detrimental to the livelihood and productivity of common people. He managed to attract a large following during his lifetime which rivaled that of Confucius. His followers—mostly technicians and craftspeople—were organized in a disciplined order that studied both Mozi's philosophical and technical writings. According to some accounts of the popular understanding of Mozi at the time, he had been hailed by many as the greatest hero to come from Henan. His passion was said to be for the good of the people, without concern for personal gain or even for his own life or death. His tireless contribution to society was praised by many, including Confucius' disciple Mencius. Mencius wrote in Jinxin (Chinese: 孟子盡心; pinyin: Mengzi Jinxin) that Mozi believed in love for all mankind. As long as something benefits mankind, Mozi will pursue it even if it means hurting his head or his feet. Zhang Tai Yan said that in terms of moral virtue, even Confucius and Laozi cannot compare to Mozi. Mozi travelled from one crisis zone to another throughout the ravaged landscape of the Warring States, trying to dissuade rulers from their plans of conquest. According to the chapter "Gongshu" in Mozi, he once walked for ten days to the state of Chu in order to forestall an attack on the state of Song. At the Chu court, Mozi engaged in nine simulated war games with Gongshu Ban, the chief military strategist of Chu, and overturned each one of his stratagems. When Gongshu Ban threatened him with death, Mozi informed the king that his disciples had already trained the soldiers of Song in his fortification methods, so it would be useless to kill him. The Chu king was forced to call off the war. On the way back, however, the soldiers of Song, not recognizing him, would not allow Mozi to enter their city, and he had to spend a night freezing in the rain. After this episode, he also stopped the state of Qi from attacking the state of Lu. He taught that defense of a city does not depend only on fortification, weaponry and food supply; it is also important to keep talented people close by and to put trust in them. Though Mozi's school of thought faded into obscurity after the Warring States period, he was studied again two millennia after his death. As almost nobody had copied the texts during the last two thousand years, there was much difficulty in deciphering them. As a result, Mohism became the most difficult philosophy within the Hundred Schools of Thoughts to study. Both the Republican revolutionaries of 1911 and the Communists saw in him a surprisingly modern thinker who was stifled early in Chinese history. Mozi's moral teachings emphasized self-reflection and authenticity rather than obedience to ritual. He observed that we often learn about the world through adversity ("Embracing Scholars" in Mozi). By reflecting on one's own successes and failures, one attains true self-knowledge rather than mere conformity to ritual ("Refining Self" in Mozi). Mozi exhorted people to lead a life of asceticism and self-restraint, renouncing both material and spiritual extravagance. 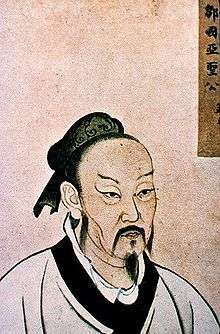 Like Confucius, Mozi idealized the Xia Dynasty and the ancients of Chinese mythology, but he criticized the Confucian belief that modern life should be patterned on the ways of the ancients. After all, he pointed out, what we think of as "ancient" was actually innovative in its time, and thus should not be used to hinder present-day innovation ("Against Confucianism, Part 3" in the Mozi). Though Mozi did not believe that history necessarily progresses, as did Han Fei Zi, he shared the latter's critique of fate (命, mìng). Mozi believed that people were capable of changing their circumstances and directing their own lives. They could do this by applying their senses to observing the world, judging objects and events by their causes, their functions, and their historical bases. ("Against Fate, Part 3") This was the "three-prong method" Mozi recommended for testing the truth or falsehood of statements. His students later expanded on this to form the School of Names. Mozi tried to replace what he considered to be the long-entrenched Chinese over-attachment to family and clan structures with the concept of "impartial caring" or "universal love" (兼愛, jiān ài). In this, he argued directly against Confucians who had argued that it was natural and correct for people to care about different people in different degrees. Mozi, in contrast, argued that people in principle should care for all people equally, a notion that philosophers in other schools found absurd, as they interpreted this notion as implying no special amount of care or duty towards one's parents and family. Overlooked by those critics, however, is a passage in the chapter on "Self-Cultivation" which states, "When people near-by are not befriended, there is no use endeavoring to attract those at a distance." This point is also precisely articulated by a Mohist in a debate with Mencius (in the Mencius), where the Mohist argues in relation to carrying out universal love, that "We begin with what is near." Also, in the first chapter of the writings of Mozi on universal love, Mozi argues that the best way of being filial to one’s parents is to be filial to the parents of others. The foundational principle is that benevolence, as well as malevolence, is requited, and that one will be treated by others as one treats others. Mozi quotes a popular passage from the Book of Odes to bring home this point: "When one throws to me a peach, I return to him a plum." One’s parents will be treated by others as one treats the parents of others. In pursuing this line of argument, Mozi was directly appealing to the idea of enlightened self-interest in social relations. Also of note is the fact that Mozi differentiated between "intention" and "actuality", thereby placing a central importance on the will to love, even though in practice it may very well be impossible to bring benefit to everyone. In addition, Mozi argued that benevolence comes to human beings "as naturally as fire turns upward or water turns downward", provided that persons in positions of authority illustrate benevolence in their own lives. In differentiating between the ideas of "universal" (jian) and "differential" (bie), Mozi said that "universal" comes from righteousness while "differential" entails human effort. Furthermore, Mozi’s basic argument concerning universal love asserts that universal love is supremely practical, and this argument was directed against those who objected that such love could not be put into practice. Mozi also held a belief in the power of ghosts and spirits, although he is often thought to have only worshipped them pragmatically. In fact, in his discussion on ghosts and spirits, he remarks that even if they did not exist, communal gatherings for the sake of making sacrificial offering would play a role in strengthening social bonds. Furthermore, for Mozi the will of Heaven (天, tiān) was that people should love one another, and that mutual love by all would bring benefit to all. Therefore, it was in everyone's interest that they love others "as they love themselves." Heaven should be respected because failing to do so would subject one to punishment. For Mozi, Heaven was not the "amoral", mystical nature of the Taoists. Rather, it was a benevolent, moral force that rewarded good and punished evil. Similar in some ways to the Abrahamic religions, Mozi believed that all living things live in a realm ruled by Heaven, and Heaven has a will which is independent from and higher than the will of man. Thus he writes that "Universal love is the Way of Heaven," since "Heaven nourishes and sustains all life without regard to status." ("Laws and Customs" in Mozi) Mozi's ideal of government, which advocated a meritocracy based on talent rather than background, also followed his idea of Heaven. What is the purpose of houses? It is to protect us from the wind and cold of winter, the heat and rain of summer, and to keep out robbers and thieves. Once these ends have been secured, that is all. Whatever does not contribute to these ends should be eliminated. Mohist ethics are considered a form of consequentialism, sometimes called state consequentialism. Mohist ethics evaluates the moral worth of an action based on how it contributes to the stability of a state, through social order, material wealth, and population growth. According to the Stanford Encyclopedia of Philosophy, Mohist consequentialism, dating back to the 5th century BC, is the "world's earliest form of consequentialism, a remarkably sophisticated version based on a plurality of intrinsic goods taken as constitutive of human welfare." Unlike utilitarianism, which views pleasure as a moral good, "the basic goods in Mohist consequentialist thinking are ... order, material wealth, and increase in population". During Mozi's era, war and famines were common, and population growth was seen as a moral necessity for a harmonious society. The "material wealth" of Mohist consequentialism refers to basic needs like shelter and clothing, and the "order" of Mohist consequentialism refers to Mozi's stance against warfare and violence, which he viewed as pointless and a threat to social stability. Stanford sinologist David Shepherd Nivison, in the The Cambridge History of Ancient China, writes that the moral goods of Mohism "are interrelated: more basic wealth, then more reproduction; more people, then more production and wealth ... if people have plenty, they would be good, filial, kind, and so on unproblematically". In contrast to Jeremy Bentham, Mozi did not believe that individual happiness was important; the consequences of the state outweigh the consequences of individual actions. Mozi tended to evaluate actions based on whether they provide benefit to the people, which he measured in terms of an enlarged population (states were sparsely populated in his day), a prosperous economy, and social order. Like other consequentialist theories, Mozi thought that actions should be measured by the way they contribute to the "greatest societal good for what we have agreed to in a social contract". With this criterion Mozi denounced things as diverse as offensive warfare, expensive funerals, and even music and dance, which he saw as serving no useful purpose. Mozi did not object to music in principle—"It's not that I don't like the sound of the drum" ("Against Music")—but only because of the heavy tax burden such activities placed on commoners and also due to the fact that officials tended to indulge in them at the expense of their duties. "Mozi" is also the name of the philosophical text compiled by Mohists from Mozi's thought. This text originally consisted of 71 chapters. 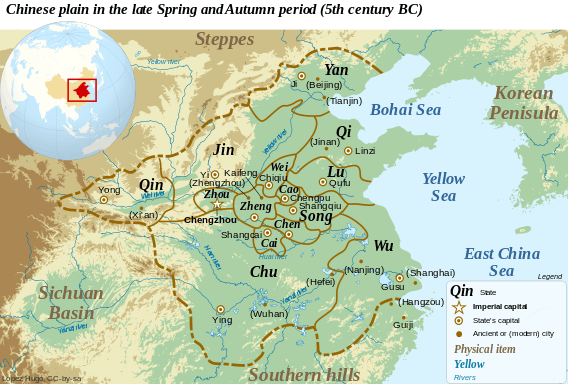 During the Han dynasty Confucianism dominated China. As Mohism is against Confucianism, the text "Mozi" was neglected. During the Song dynasty, only 61 chapters were left. 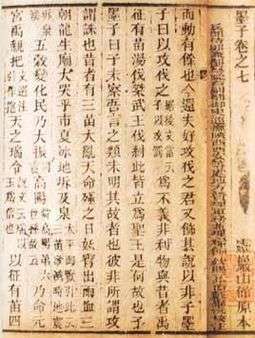 Today, we have only 53 chapters through which we attempt to understand this school of thought, as compiled by Sun Yirang. Because Mohism disappeared as a living tradition from China, its texts were not well maintained, and many chapters are missing or in a corrupted state. For example, of the three chapters "Against Confucianism", only one remains. The collection of texts from "Mozi" is a rich source of insight into early Chinese dynastic history and culture. Much of Mozi's arguments are supported by the historical claims of even earlier records. His conversations with other renowned philosophers of that era are also recorded. From them, we can distinguish Mohism from other schools of thought more clearly. Mohism was suppressed under the Qin and died out completely under the Han, which made Confucianism the official doctrine. However, many of its ideas were dissolved into the mainstream of Chinese thought, since both Confucians such as Xunzi and Taoists such as Zhuangzi expressed sympathy with Mozi's concerns. The influence of Mozi is still visible in many Han works written hundreds of years later. In modern times, Mohism was given a fresh analysis. Sun Yat-Sen used "universal love" as one of the foundations for his idea of Chinese democracy. More recently, Chinese scholars under Communism have tried to rehabilitate Mozi as a "philosopher of the people", highlighting his rational-empirical approach to the world as well as his "proletarian" background. Some views claim that Mozi's philosophy was at once more advanced and less so than that of Confucius. His concept of "universal love" embraced a broader idea of human community than that of the Confucians, but he was less tolerant than Confucius in his condemnation of all that is not directly "useful," neglecting the humanizing functions of art and music. Zhuangzi, who criticized both the Confucians and the Mohists, had this in mind in his parables on the "usefulness of the useless". Of course, this insistence on usefulness comes from a time when war and famine were widespread and could well have made all the royal pageantry look frivolous. However, others would say the above view is not entirely accurate, and that in fact "universal love" (博愛), as well as "the world as a commonwealth shared by all" (天下為公) advocated by Sun Yat-Sen are Confucian ideas. "Universal love" (博愛, Boai) in Confucianism is a little different from Mozi's "universal love" (兼愛, Jian'ai): in Confucianism it tends to emphasize it as naturally befitting human relations, while in Mozi's ideas it tends to be community oriented and non-differentiated according to individual. Some modern-day supporters for Mozi (as well as Communism) make the claim that Mohism and modern Communism share a lot in terms of ideals for community life. Others would claim that Mohism shares more with the central ideas of Christianity, especially in terms of the idea of "universal love" (in Greek, "agape"), the "Golden Rule", and the relation of humanity to the supernatural realm. According to Joseph Needham, Mozi (collected writings of those in the tradition of Mozi, some of which might have been by Mozi himself) contains the following sentence: 'The cessation of motion is due to the opposing force... If there is no opposing force... the motion will never stop. This is as true as that an ox is not a horse.' which, he claims, is a precursor to Newton's first law of motion. Mozi also contains speculations in optics and mechanics that are similarly strikingly original, although their ideas were not taken up by later Chinese philosophers. The Mohist tradition is also highly unusual in Chinese thought in that it devoted time to developing principles of logic. Quantum Experiments at Space Scale, a joint Austrian-Chinese satellite launched in 2016, alternatively named "Mozi" or "Micius" because of his writings on optics. ↑ Hansen, Chad (1992). A Daoist Theory of Chinese Thought: A Philosophical Interpretation. Oxford University Press. p. 394. ISBN 0-19-506729-0. There was a fleeting movement to introduce use of Micius for Mozi, whose bones no doubt relaxed when the movement failed. ↑ Fraser, Chris (2002). "Mohism". "The Stanford Encyclopedia of Philosophy". ↑ Needham & Wang 1956 165. ↑ Needham & Wang 1956 165–184. 1 2 Van Norden, Bryan W. (2011). Introduction to Classical Chinese Philosophy. Hackett Publishing. p. 52. ISBN 978-1-60384-468-0. ↑ Fraser, Chris, "Mohism", The Stanford Encyclopedia of Philosophy , Edward N. Zalta. 1 2 3 Loewe, Michael; Shaughnessy, Edward L. (2011). The Cambridge History of Ancient China. Cambridge University Press. p. 761. ISBN 978-0-521-47030-8. ↑ Han Yu: "Universal love" (博愛, Boai) means Ren (Humanity) (韓愈: 博愛之謂仁). ↑ "Mozu". New World Encyclopedia. Retrieved 2016-06-02. Graham, A. C. (1993). 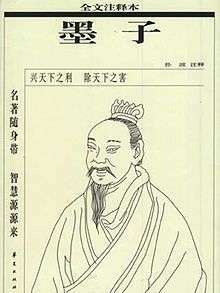 "Mo tzu 墨子". In Loewe, Michael, ed. Early Chinese Texts – A Bibliographical Guide. Berkeley: Society for the Study of Early China & Institute of East Asian Studies, University of California Berkeley. pp. 336–41. ISBN 1-55729-043-1. Knechtges, David R. (2010). "Mozi 墨子". In Knechtges, David R.; Chang, Taiping. Ancient and Early Medieval Chinese Literature: A Reference Guide, Part One. Leiden: Brill. pp. 677–81. ISBN 978-90-04-19127-3. Needham, Joseph; Wang, Ling (1956). Science and Civilization in China. 2. History of Scientific Thought. Cambridge University Press. ISBN 0-521-05800-7. . (Printings were 1956, 1962, 1969) See also the 1986 edition published in Taipei by Caves Books Ltd.
Wing-tsit Chan, ed. A Source Book in Chinese Philosophy. Princeton University Press, Princeton 1969, ISBN 0-691-01964-9. Wejen Chang: Traditional Chinese Jurisprudence : Legal Thought of Pre-Qin Thinkers. Cambridge 1990. Geaney, Jane. “A Critique of A. C. Graham's Reconstruction of the ‘Neo-Mohist Canons,’” Journal of the American Oriental Society, 119, no. 1 (1999), pp. 1–11. —. Later Mohist Logic, Ethics and Science by A. C. Graham, (1978, reprinted 2004) The Chinese University Press, Hong Kong. 700 pages. Hansen, Chad. "Mozi: Language Utilitarianism: The Structure of Ethics in Classical China," The Journal of Chinese Philosophy 16 (1989) pp. 355–380. Hsiao, Kung-chuan Hsiao. A History of Chinese Political Thought. In: Volume One: From the Beginnings to the Sixth Century A.D.. Princeton University Press, Princeton 1979 (übersetzt von F. W. Mote). Mei, Y. P. Mo-tse, the Neglected Rival of Confucius. London: Arthur Probsthain, 1934. Moritz, Ralf. Die Philosophie im alten China. Deutscher Verlag der Wissenschaften, Berlin 1990, ISBN 3-326-00466-4. Opitz, Peter J. Der Weg des Himmels: Zum Geist und zur Gestalt des politischen Denkens im klassischen China. Fink, München 1999, ISBN 3-7705-3380-1. Vitalii Aronovich Rubin: Individual and State in Ancient China: Essays on Four Chinese Philosophers. Columbia University Press, New York 1976, ISBN 0-231-04064-4. Helwig Schmidt-Glintzer, Helwig, ed. : Mo Ti: Von der Liebe des Himmels zu den Menschen. Diederichs, München 1992, ISBN 3-424-01029-4. —. Mo Ti: Solidarität und allgemeine Menschenliebe. Diederichs, Düsseldorf/Köln 1975, ISBN 3-424-00509-6. —. Mo Ti: Gegen den Krieg. Diederichs, Düsseldorf/Köln 1975, ISBN 3-424-00509-6. Bertolt Brecht. Me-ti. Buch der Wendungen. Suhrkamp, Frankfurt 1971. Sun Yirang (孙诒让), ed. Mozi xiangu 墨子闲诂 (Notes to Mozi). Zhonghua shuju, Beijing 2001. Yates, Robin D. S. "The Mohists on Warfare: Technology, Technique, and Justification", Journal of the American Academy of Religion, 47, mo. 3 (1980, Thematic Issue S), pp. 549–603.